LEXINGTON, KY - The best thing about viewing a stallion at the launch of his stud career is also what's best about breeding Thoroughbreds in general: anticipation. Take a star horse off the racetrack and the characteristics he displayed in competition could pass down through generations, that mix of heart and power and speed replicated four, five, ten years from now. It's why pedigree analysts compare bloodlines, why a good mare is worth her weight in gold, why people who have bred and owned racehorses for generations never feel it grow old. While a foal has the potential to be any kind of runner, a new sire is also anticipated as he begins his next chapter in life. He could be something special at this job, too. This party has been a fan of one lithe bay runner since last summer's visit to the Saratoga shedrow of Donnie K. Von Hemel. 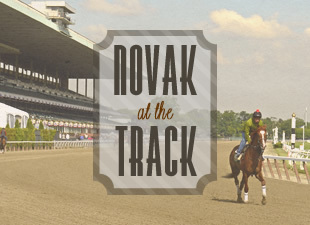 The topic at hand was Alternation, who would run fourth in the Jim Dandy (gr. 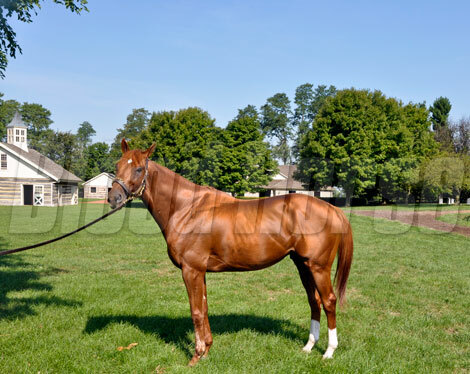 II) that year before greatly improving this season, but catching the eye was this "other" horse, the Ohio Derby (gr. III) winner who wound up blowing away the competiton with a four-length romp in the Amsterdam (gr. II). The hard-driving speedster next took down Uncle Mo with a thrilling late run in the Foxwoods King's Bishop (gr. I) for McNeil Stables and Cheyenne Stables, and a few months later found Breeders' Cup victory by four lengths over Shackleford in the Dirt Mile (gr. I). Caleb's Posse was a joy to watch, every time he ran. The disappointment of hearing the son of Posse had been retired from racing in June was made a little lighter by the location of his new home, an easy drive just over the hill to Robert Clay's Three Chimneys Farm. Just as R. B. Cunningham-Graham wrote "God forbid that I should go to any heaven in which there are no horses," a horse might be inclined to select the Lexington showcase as the ultimate haven post-racing career. Easing a racehorse down off a training regimen is a tricky process - horses are creatures of habit, and Thoroughbreds are conditioned to run - so Caleb has been enjoying controlled turnout in a limited paddock at Three Chimneys. The bay 4-year-old is a little light but looks good and should pick up more flesh as he adjusts to his new life. He has a lovely disposition and was easy to handle. Apparently, he thinks the most important job for a new stallion is eating grass. A few weeks after Caleb's Posse joined the Three Chimneys roster, it was announced that Ice Box would join him at the Lexington farm. The 5-year-old son of Pulpit raced gamely for Robert LaPenta and Hall of Fame trainer Nick Zito through the 2010 Triple Crown season, winning the Florida Derby (gr. 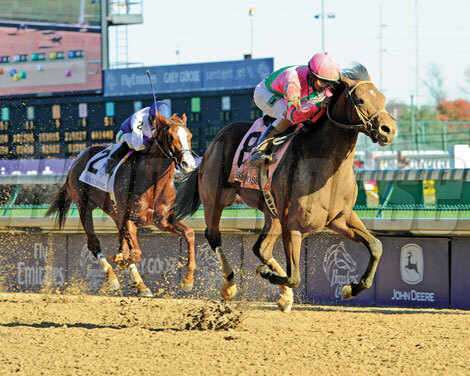 I) and finishing second to Super Saver in the Kentucky Derby Presented by Yum! Brands (gr. I). Ice Box entered stud in 2012 at Calumet Farm, but the sale of Calumet to Brad Kelley necessitated his move. Already acclimated to life off the racetrack, he has settled in well at his new home and is turned out in a large paddock much of the day. 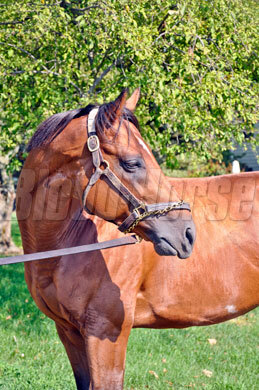 His striking chestnut coat gleamed in the sun as he posed for pictures. Ice Box is quite the character. He stood to strike poses for several moments, pricking his ears and looking off into the distance with a regal racehorse eye. 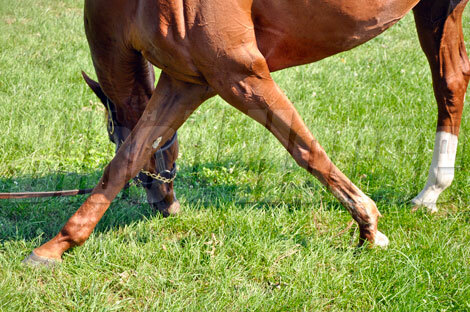 Then he got down to business - a demonstration of his proven athleticism with a unique flexible grazing stance. Olympics, anyone? No visit to Three Chimneys would be complete without seeing Surfer Girl and her first foal, a precocious Pulpit filly who is a few weeks away from becoming a weanling. Both horses are owned by sports media personality Jim Rome, whose brash and hard-hitting professional image is worlds apart from his personal love for these Thoroughbreds. I interviewed Jim for a Horse Player Magazine article back in early 2011, and Surfer was the subject of an ESPN.com blog last spring after she retired. The Brazilian-bred daughter of Wild Event now looks a little more matronly, but no less refined. She's back in foal to Sky Mesa; her daughter looks a lot like mom. One of Surfer Girl's idiosyncrasies, picked up from her time in training with Southern California horseman Mike Puype, is a fondness for jellybeans. 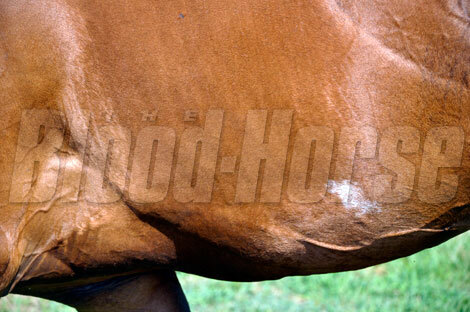 Her filly has developed an acquired taste as well, and the team keeps a bag on hand in the office for both. I love the above shot of Burton, who keeps Rome updated with regular emails and photos of "the girls." His fondness for his charges shines through when he's around them, and while Rome remains in Southern California, there's no doubt he leaves his horses in good hands. Speaking of leaving horses in good hands, another contender for Rome's Jungle Racing was a horse named Gallatin's Run. The 6-year-old Florida-bred son of Alke ran 12 times for Jungle Racing, but was lost on a claim at Del Mar in August of 2011. Off the track for three months, he reappeared at Beulah Park in November but was not entered for a tag. 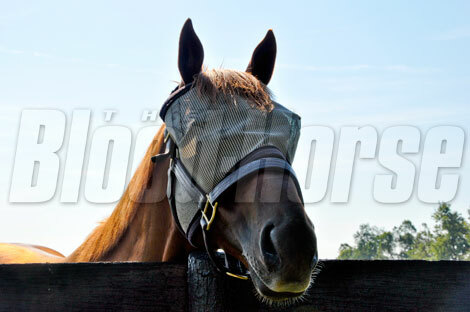 When he ran the next time at Churchill Downs, Rome commendably claimed him back to retire him to a happy home. Gallatin is getting some much-deserved rest turned out with his pasture buddy, a Lord At War retiree named Lordy Lordy Lordy. I swung by his paddock before leaving the farm and he ambled over to the fence to pay his regards. It makes me happy to see a runner who gave his all on the track being treated with respect and dignity even though he wasn't a star. Gallatin only won three times for Jungle Racing, but he put his heart and body on the line every time and no matter what he goes on to do in his second life, he deserves the good care he receives. More owners should take responsibility this way. Caleb's Posse says "get my good side"